We’re proud to announce that we just launched 3 new On-Site Promotions. These new On-Site Promotions will help you to show off your awesome reviews to potential customers on your website. The Product Reviews Suite is a project we’ve been working on for the past few months due to user demand and includes several individual features to help you win over customer’s trust and increase your onsite conversion rates. Within your TrustSpot Account, you will see a new tab on the left called “Product Reviews”, once opened all of the options will now be available to you. Published: Reviews located here are public and visible on your site. You can select to unpublish them which will hide them from visibility, publish them as a business review, post a response to the customer or flag the review. Pending review: Reviews which are unpubished are placed here and are not public/visible on your site. Flagged: Reviews which you flag are placed here, and are not public/visible on your site. On each of your product pages our review widget will sit. This is where site visitors can see your product reviews, company reviews and Q&A. They can also ask questions from here as well. With our Ultimate package you will also have the additional option to fully customize your widget to match your site’s color scheme. Engage directly with potential buyers, as well as existing loyal customers through community Q&A. Potential buyers can ask questions about a product directly on the product page. Other customers can answer, or you can answer questions yourself. This low friction, extremely easy interface will net you more sales. If a potential customer has a question, they would normally have to find your contact page, copy the email, go to their email, etc… it’s time consuming, tedious, and many customers won’t bother. 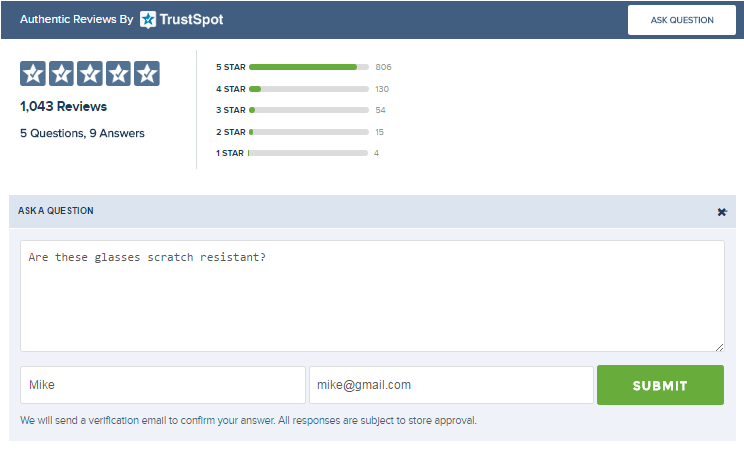 TrustSpot Q&A is seamless and easy. The Product Review email is similar to the Company Review email in which your customers can insert their responses directly into the email. 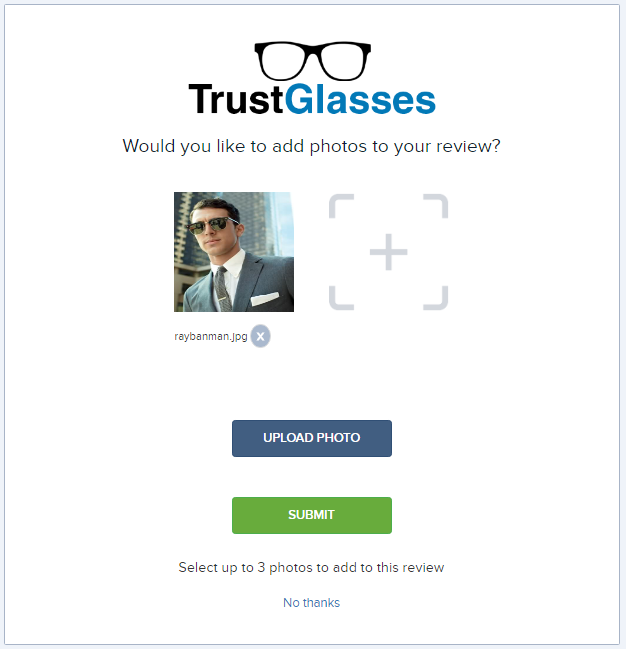 Allow customers to upload photos alongside their reviews. Images add so much to the legitimacy of the review, and helps build loyal, passionate fans around your brand. Post the photos to your company Facebook page with 1 click. We now support several new languages within the TrustSpot system including: English, Spanish, French, Italian, German, Swedish and Finnish. We have numerous extensions available that support product reviews and are adding more! Easily integrate our eCommerce app into your store and begin collecting reviews within minutes. 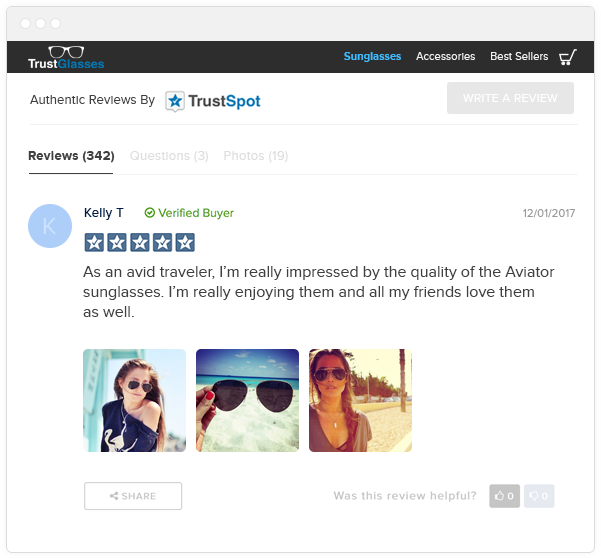 Plugins will automatically trigger TrustSpot review request emails for your products. Many plugins will also automatically add the review widget to your product pages for you upon installation, as well as inline stars on product category pages. We support the following systems now: Magento 1.x, Magento 2.x, Shopify, WooCommerce, Prestashop and OpenCart 2.